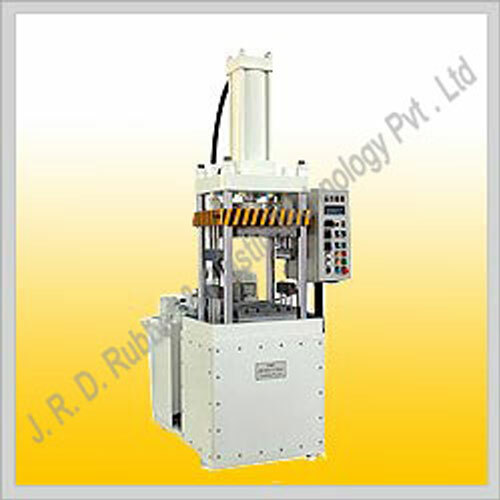 CEV & CE series are state-of the-art, Down Stroke and Up Stroke, hydraulic compression moulding machines respectively. They are based on advance U.S designs; offering customers accurate, sturdy, deflection free machines at economical Indian prices. Besides, moulding rubber, plastic, composites they can be used for wide variety of functions as bonding, laminating, assembling etc. These presses provide uniform and constant curing pressure; an essential requisite for accurate moulding through the modern energy efficient hydraulic system. The design of these machines allows you one to mould with the two mould halves fixed on the heated platens. The machine opening facilitates the mould opening thus eliminating the need to take out the mould out of the press each time. This also eliminates the heat loss problem when moulds are brought out in each cycle. 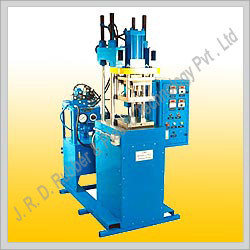 JRD presses like vacuum moulding machines and hydraulic compression moulding machines are fitted with user friendly, reliable PLC based controls enabling perfect repeatability of all the machine parameters. The presses have features of automatic degassing (0-99 times); pressing & degassing times that can be independently set and adjustable and the distance of mould opening for degassing that can be freely set. 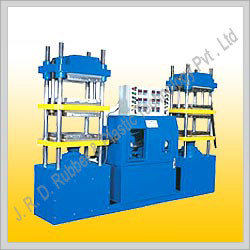 We are leading manufacturer of Moulding machines. 60 ton, Down Stroke, Compression molding machine with useful feature of Top & Bottom Hydraulic Core lifters which enables automatic operation of 3 or 4 plate compression molds. The top core lifter enables molder to use the same press for compression/transfer molding. 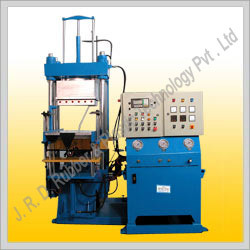 These Hydraulic Press are effective to use. 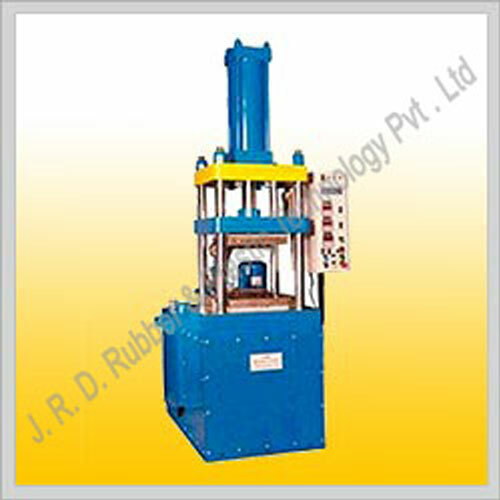 We provide these Hydraulic Press at best market price. 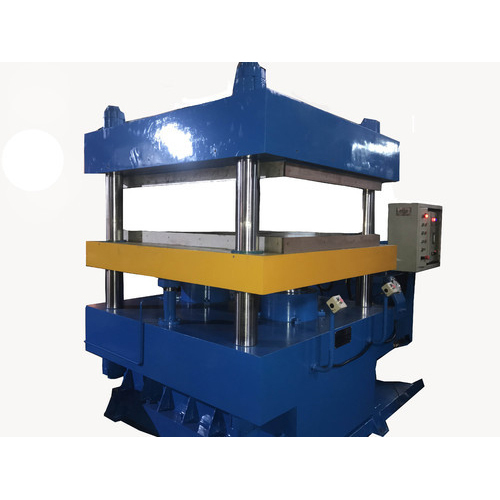 60 ton, Down Stroke, Compression moulding machine with useful feature of Top & Bottom Hydraulic Corelifters which enables automatic operation of 3 or 4 plate compression moulds. The top corelifter enables moulder to use the same press for compression/transfer moulding. 100 ton, Down Stroke, Double Station, Compression moulding machine. It is has the useful feature of top & bottom hydraulic corelifters on each station which enables automatic operation of 3 or 4 plate compression mould. The top corelifters allows moulders to use the twin station press for compression/transfer moulding. The common hydraulic system in the middle, operates both the stations. The user friendly & reliable controls based on PLC & MMI. provide sequential operation control of both stations These Twin Station Presses provide versatility and performance with economy. Integral Hydraulic System based on manifold which reduces the piping & leakage potential. JRD CE series, up stroke presses are also offered with double daylight in both single & twin station configurations. Digital display & electronic control of clamp force, speed & heat. 100 ton, Up Stroke, Double Station, Double Daylight, Compression moulding machine.. The common hydraulic system in the middle, operates the twin stations with two daylights. The user friendly & reliable controls based on PLC & MMI. provide sequential operation control of both stations. 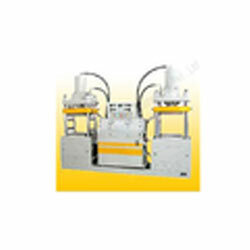 VACE series are state-of the-art, up stroke, hydraulic vacuum chamber compression moulding machines. They are used for moulding rubber, silicone & composites materials. Our Vacuum Chamber Presses find special use in applications such as O rings, oil seals, washers, gaskets and medical parts where air trapping in moulded parts and insufficiently filled cavities are commonly faced problems. Besides eliminating these problems JRD vacuum presses also reduce the vulcanization time by up to50% due to improved heat transfer from tool to part. These Presses are also available with die sliding/ejector arrangement and tilting of upper platen for easier access. 150 ton, upstroke vacuum compression moulding machine (20'' x 20'' platen) with mould sliding out arrangement and corelifters. Backed by the team of skilled professionals, we are successfully fabricating most efficient compression molding presses with four-pillar type construction. We are offering Compression Moulding Machine, Up Stroke, Hydraulic PLC & Touch Screen Controlled Compression Moulding Machine With 1000mm x 1500mm Heated Platens.